Now settling in the Cambodian capital Phnom Penh, without close relatives to accompany him, where unlike his Seattle home there is no local McDonald’s, Phatry Derek Pan  adapts to a new pace of life. Slim and charming Phatry speaks fluent English and holds an American passport. Wearing a T-shirt and Khor Chev, (long pants popular among Cambodian farmers), and speaking broken Khmer, the 27-year-old does not look foreign to Khmer people, and he doesn’t see himself as a foreigner amongst Khmer. Phatry is an extrovert young man. He makes friends easily and gets to know people from every walk of life. To finance his three-year stay in Cambodia, the home country of his parents, he earns a living through his story-telling talents, mainly writing. In the United States, some of his friends and people he encountered nicknamed him ‘Mr. Khmer-connection,’ because he is famous as an American skilled at Khmer communications. It took the Cambodian-born American two and a half decades before visiting his parents’ home for the first time . 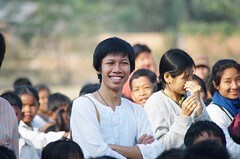 Phatry believes his three-year residency in Cambodia will enable a first-hand understanding regarding his immediate ancestry rooted in a land known for its contradictory and tumultuous history of cultural glory and ethnic peacefulness until most recently, Pol Pot's violent genocidal chapter scarred and still shadows present-day Cambodians. In his second trip to Siem Reap, gateway to ancient temples and the nation’s rich history, the young fellow is more than fascinated by century-old temples. “This second trip will not serve as my last to Angkor. Surely, I hope to visit again in the coming months. What I look forward most on my third trip is visiting a small temple that bears my name. Really, no joke. If my name is unique as it is, it was a pleasant surprise to make the discovery on the map. I wonder what the history behind Prasat [temple] Patri is. Does anyone know?” wrote  Phatry. It may take him longer than three years to establish his very own identity. The Khmer Rouge's genocide, not yet one generation old, created a river of tears with personal, economical, and cultural impact surpassing the magnitude of Mekong. The ripple-effect of unhealed war trauma still invisibly breeds within each new generation. During Phatry's wandering in Cambodia he will record what he recovers about the past and current social order and social disorder . On a charity trip to Prey Veng province, like all other days, Phatry jotted down  thoughts and observations when a group of university students delivered books and pencils to rural schoolchildren. As Phatry's foundational perspective regarding his homeland evolves, he will return to the United States to pursue a four-year Juris Doctor program. A prolific writer, Phatry hopes his three-years’ experiential work, will become the masterpiece that opens a magical window inviting younger generations of Khmer-Americans to understand Cambodia as their home country, rather than a tourist destination where they can enjoy cheap beer  at nightclubs during school vacation.